‘We have to rethink everything’ says noted environmentalist. A Tyee Q&A. Flooding valuable farmland to build the Site C dam undermines Canada’s commitment to meet international climate-change targets, environmentalist David Suzuki said outside a B.C. courtroom this week. The farmland is needed to reduce B.C.’s dependence on imported foods, Suzuki said, and eliminate the huge amounts of carbon fuels needed to bring those foods here. “It seems to me crazy to put farmland in the north underwater,” he said. “We live in a food chain now in which food grows on average 3,000 kilometres from where it’s consumed. The transport of all that food is dependent on fossil fuels. “Food has got to be grown much closer to where it’s going to be consumed,” he said. Instead of building dams and pipelines, Canada should “massively encourage” wind, solar and geothermal energy projects and put a stiff price on carbon emissions, he said. Suzuki joined Grand Chief Stewart Phillip, head of the Union of B.C. Indian Chiefs, at a news conference on the steps of B.C. Supreme Court just before the latest battle over the Site C hydroelectric project began inside. BC Hydro is seeking an injunction to prevent protesters at the Rocky Mountain Fort camp from “physically interfering” with the construction of Site C. The B.C. government approved the $8.3-billion dam in late 2014. If completed, Site C would flood about 83 kilometres of the Peace River valley near Hudson’s Hope, much of it fertile land, and generate enough electricity to power 450,000 homes. Phillip said he was supporting the “brave young people and landowners” seeking to block the bulldozers. Site C is a make-work project intended to hide the failure of Premier Christy Clark’s “pipe dream” of creating a liquefied natural gas industry, he said. A provincial government spokesman said the lost farmland is not significant in the context of B.C. or western Canadian agricultural production. “Site C is the cleanest option for generating electricity in B.C. other than nuclear power,” wrote David Haslam, communications director for the energy and mines ministry. “The planning for Site C began well before the emerging LNG industry was contemplated — so to say it’s being built for LNG is incorrect,” he added. 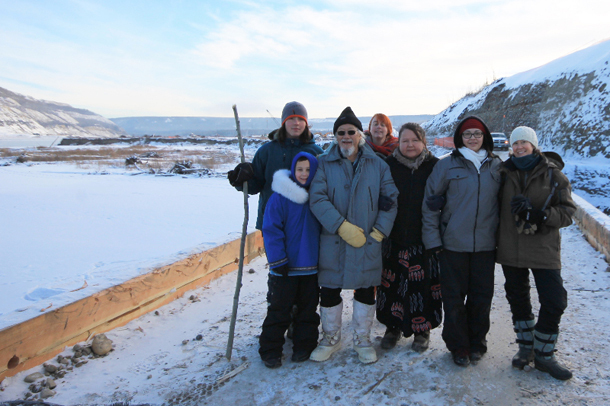 David Suzuki visits the Rocky Mountain Fort protest camp on the banks of the Peace River in northeast B.C. in December. Photo by Sage Birley. Canada supported a global target of keeping temperatures from rising more than 1.5 Celsius this century at December’s COP-21 global summit on climate change in Paris. A First Minister’s Meeting in Vancouver on March 3 is expected to focus on Canada’s climate plan. In the wake of his Site C opposition, The Tyee asked Suzuki about what Canada should be building, post-Paris, if not dams or oil pipelines to build a low-carbon economy. Our interview is edited for clarity. The Tyee: With Canada’s stated goal to build a low-carbon economy, you and Grand Chief Phillip have stood against building this giant dam as well as giant pipelines. What should Canada be building? David Suzuki: [We need] massive encouragement of renewable energy, obviously. We’re going to need a new network of wires to accept the electricity coming from many different sources. We have to put a price on carbon, and a serious price, not $10 a tonne or anything. Sweden imposed a carbon tax in 1991 — $133 a tonne, which has been raised to over $160 a tonne now. And between 1991 and 2008, the economy of Sweden grew by 44 per cent. Fossil fuel use pervades every aspect of the way that we live. Agriculture is just one of the areas where we have to rethink everything. It’s crazy to put that fertile farmland in the Peace Valley Site C under water now in a carbon-constrained world. We need to rethink everything. From the way we live in our buildings, to the way we move. Agriculture is important… I really think the food chain that we’ve developed where Canadians think they can eat fresh fruit and vegetables 12 months a year [needs to change] — we’re a northern country for God’s sake! Is there any obvious “low hanging fruit,” so to speak, in terms of where Canada can go with low-carbon food production? I was just in France last year, and for the French of course food is very, very important. [There were] huge areas for frozen foods. They clearly prepare their summer fruits and vegetables, but freeze them. That’s the kind of thing that we’re going to have to start thinking about. We just have to put everything together — everything is done in such a helter-skelter way. If in fact we are serious about a 1.5-degree rise — we’ve already used up one of those — one degree! Why is there a debate about pipelines? We shouldn’t be putting a penny into pipelines. Why are we building coal-exporting terminals? We shouldn’t be doing any of that. We have to get off fossil fuels, and that means we’ve got to change everything. We’ve got to stop subsidizing the fossil fuel industry, and we know we are going to have to leave 80 per cent of our known reserves in the ground. And I don’t see that kind of thinking going on at the federal or provincial level. What do you think the conversation at the First Ministers’ Meeting with the prime minister in Vancouver next month will be, in terms of meeting our Paris climate promises? My suspicion is there’s going to be a great deal of banter about how we rescue a province that’s been heavily dependent on fossil fuels, and is now suffering a low [oil] price. What do you make of the idea of a “just transition” and including people who have been working on the oil and gas sector in the climate-change discussion? The guys that were drilling — they are pipe fitters, they have skills that are absolutely essential for geothermal, solar and wind. I think the challenge is to make a transition and help those workers. They are energy workers. They are not oil workers. Let’s get them to make a transition to the energy of the future, which is renewables.